The koto is an instrument that I love. I was first introduced to it in 1985 as an exchange student. The Japanese school teachers dressed me in kimono and shown how to pluck the strings of the koto. It was a lot of fun because I got so much sudden attention. There were cameras, kimono dressers, koto teachers who all pitched in for an hour or so to get some good photos for the school magazine. I was in my element. That was until I had to stand up when the event was finished. My legs had gone numb and I was unable to move from the kneeling position I was in. Perhaps koto playing in kimono needed to be left to the experts who were most likely used to kneeling in one position for an hour or more. 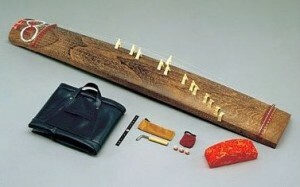 Have you got a favourite Japanese musical instrument? Many years later, when I was living in Tokyo as an adult, I met a lovely American family who had a daughter they called Koto. It always made me wonder if they also loved the koto too and whether that was why they had chosen that word for their daughter’s name. I suppose I should have asked them.